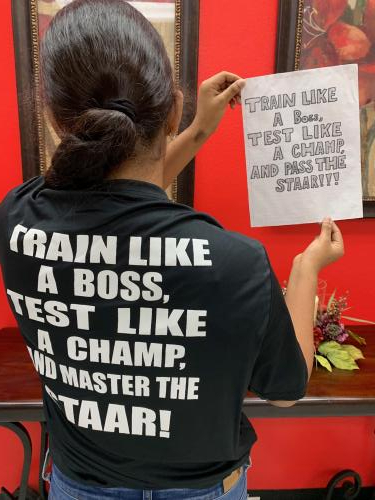 Escandon Elementary is proud to have Silvia Neri as their official t-shirt designer for the upcoming STAAR test shirt. All 3rd, 4th and 5th grade students participated in a t-shirt design contest during a two-week period in February. Students were given required criteria to meet before beginning their designs. During the competition, teachers utilized the writing process and problem-solving skills to edit and revise the student’s presentations on designs. Students presented and communicated the purpose for choosing the design and it’s meaning to classmates. After the two-week period, the top 3 designs by grade level were chosen. Escandon staff voted after seeing all the top designs. 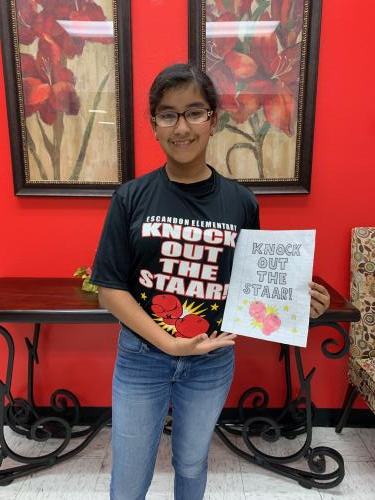 Sylvia Neri, a 5th grade student, was proudly nominated as the STAAR t-shirt winner. Students cheered with pride and congratulated Sylvia Neri on her design. All 3rd-5th grade students will receive a shirt to wear during STAAR Pep Rallies and STAAR Motivational Talks. 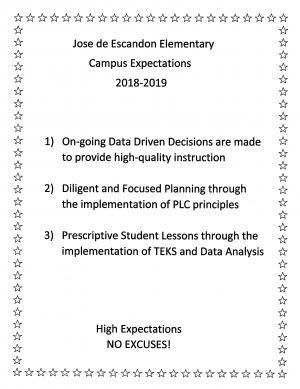 Welcome to Jose de Escandon Elementary! 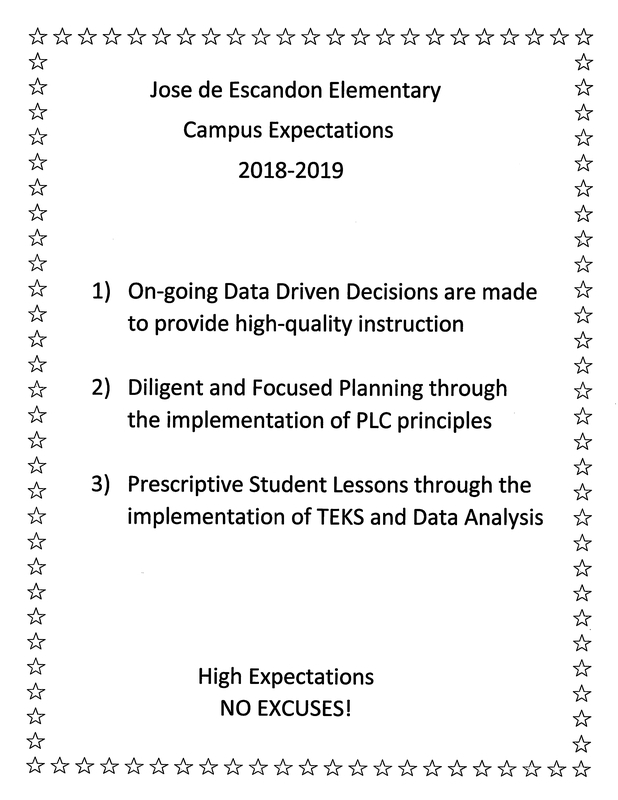 Jose De Escandon Elementary School educates Pre-Kinder through 5th grade students. 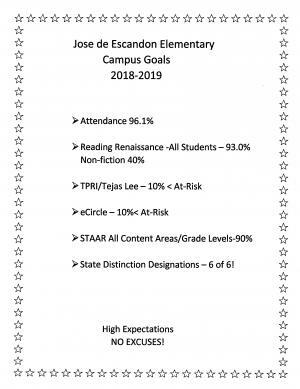 We are a student-centered, data-driven, attendance focused campus that is fully committed to our students and our community: High Expectations, NO EXCUSES! Our mission is to provide students a challenging and exhilarating educational experience using prescribed lessons that challenge our students in their academic achievement. Our students will accomplish their personal growth through continued in-depth instruction, productive partnerships with parents and individual personal integrity and responsibility. 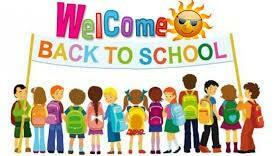 It is our great privilege and pleasure to serve you and your children.